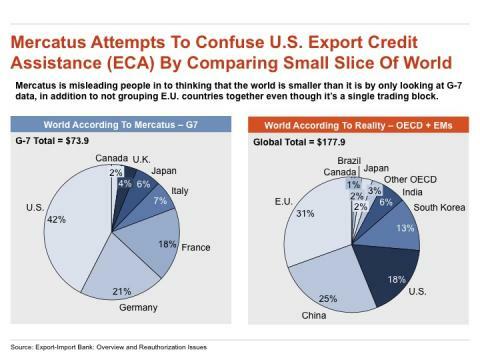 The Mercatus Center’s Veronique de Rugy – a regular purveyor of misleading information about the U.S. Export-Import Bank – is at it again with a chart purporting to show that the U.S. plays an outsized role in offering export credit assistance. De Rugy cherry-picked her analysis by focusing only on the G7 countries, excluding America’s largest competitors, like, say China. Even for de Rugy this is a silly and outrageously misleading presentation. 1) De Rugy doesn’t adjust for GDP. The U.S. is by far the largest economy in the G7 and it’s reasonable that its programs will be proportional to its size. Adjusting for GDP turns de Rugy’s point on its head, properly placing the U.S. near the bottom of the list of our competitors. 2) Four EU countries – the UK, France, Germany, and Italy – are all members of the G7 and they’re big users of export credit assistance. 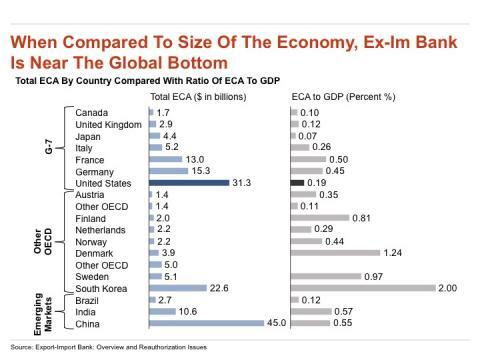 Taken together — even within de Rugy’s silly G7 confines — they dwarf the Ex-Im Bank. In fact, it would be more appropriate to aggregate export credit assistance offered by all EU countries, not just the handful in the G7. 3) By choosing only G7 countries, de Rugy conveniently excludes some of America’s largest competitors and most aggressive users of export credit assistance: China, Russia, and Korea. De Rugy’s point is both inaccurate and sophomoric. Reporters and congressional offices should be wary of her work. Tony Fratto is a partner at Hamilton Place Strategies, and a former Assistant Secretary at the U.S. Treasury Department and Principal Deputy Press Secretary at the White House.